Sovngarde Hero is a common Willpower creature card. It is a creature summoned by Call of Valor. 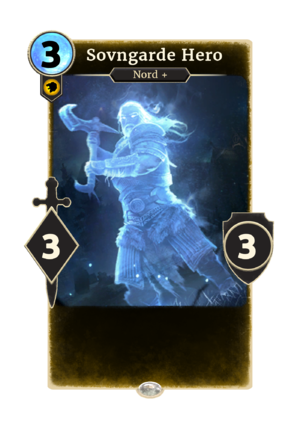 The card, and its parent shout, are based on Call of Valor, a shout which appeared in Skyrim. The warrior depicted in this card's art is not visually similar to any heroes who appeared in Skyrim. The card's creature type was originally solely Nord, until the Spirit subtype was added in Patch 1.68.0. This page was last modified on 27 February 2019, at 23:08.